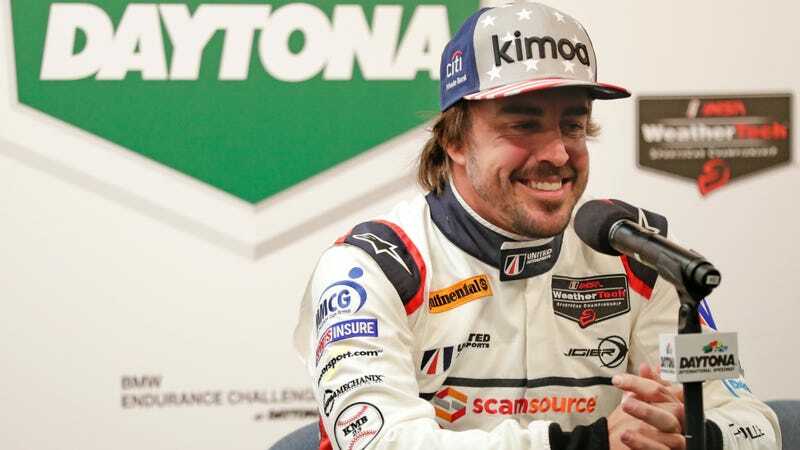 McLaren Formula One driver Fernando Alonso’s quest to win the Triple Crown of Motorsport is one of the most pure and good things in motorsport right now. Lest you think “guy who likes racing does more of it and has fun” is a no-brainer, here’s ex-Red Bull F1, ex-Porsche 919 driver Mark Webber with a bad take. No, [running the 24 Hours of Daytona is] a mistake. They are two totally different things that both absorb a lot of mental energy. I think if you’re doing F1 you can’t afford distractions — (F1) is so specific that it doesn’t allow room. If this hot take sounds familiar, you may be remembering widely reviled ex-F1 boss Bernie Ecclestone’s remarks on the matter. Ecclestone said he would have tried to block Alonso from doing the Indianapolis 500 last year because Alonso was in F1, and F1 should’ve gotten his full attention. Never mind any potential for F1 to reach out to other fanbases in racing, or for fans to see F1's stars battle against drivers in other series, right? Yet Alonso’s Indy run was one of the most exciting things in motorsport last year, as fans appreciate a truly old-school driver who wants to win at everything. Sigh. We were hoping Bernie’s “F1 drivers should do F1 only” attitude was mostly gone, what with F1 driver Lance Stroll also making a run at Daytona, but here it is again. Hilariously, Webber’s take doesn’t even jive with the experience of one of Webber’s own teammates from the Porsche 919 Le Mans prototype team. Webber raced Porsche’s LMP1 after leaving F1, however, one driver brought in to help Porsche win the 24 Hours of Le Mans in 2015 was none other than then-Force India F1 driver Nico Hülkenberg. That was with a second-rate team in F1. The pressures are different. He was also with the top Le Mans team and that simplified things a lot. This bizarre defense only makes Hülkenberg’s Le Mans run sound even more like Alonso’s situation. McLaren has sucked ever since they took on Honda power units several years ago, and Alonso’s rumored to be running with Toyota at Le Mans—the only manufacturer team left in Le Mans’ top class. To say this could finally be Toyota’s year to win it all is an understatement. If he wins it would be amazing. He’s a driver with talent unlike almost anyone else in the world. It would be fantastic, but it will not give him anything. Holy crap, that’s a depressing take. Just let Alonso go have fun already, and do what makes him happy.